Two years ago this time, Brian was bringing you news of a new Valentine’s candy made just for the dejected singles among us, BitterSweets. Being a dejected single myself, I jumped at the chance to sample this year’s batch. Now, I know you’ve seen those little heart-shaped candies imprinted with messages that always seem to circulate around Valentine’s Day. In fact, you may even have hazarded to taste one. If you’re like most of the universe, you learned your lesson then and there. It turns out candies with sweet sayings on them tend to have little flavor in them. This is where I have to admit that I actually like conversation hearts. Yes, that’s right world, I have bought them simply to consume rather than to share. It seems that I once got a strange batch that was, for some unknown but likely toxic reason, easy to chew. Ever since then, I’ve been seeking out that elusive texture. Unable to find it again, I guess I just learned to enjoy the tooth-breaking snap of the regular hearts. Of course, that’s only if I can manage not to gag on the cutesy little sayings stamped on each one. Now, finally, I have an option that allows me to enjoy the hearts while staying well within my comfort zone of sarcasm and general anti-Valentine’s Day-ness. 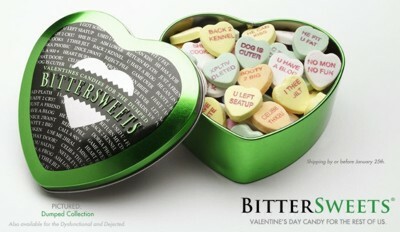 As indicated on the Bittersweets site, the hearts come in six different flavors: Banana Chalk, Grape Dust, Nappy-Citric, You-Call-This-Lime?, Pink Sand and Fossilized Antacid. Banana Chalk: This one reminds me strongly of circus peanuts, though I’m not really sure how that’s banana. Still, if you like circus peanuts, you’ll like this. Grape Dust: The grape here is very reminiscent of a sort of medicinal grape flavor. Sad as it is, I love it! Medicine grape is one of my absolute favorite flavors; I still use children’s Dimetapp because I love that great grape taste! This is very similar, and pretty strong in each piece. Delicious! Nappy-Citric: Mmm, this has that flavor of an orange Popsicle. Not one of those real fruit juice ones, oh no, but one of the sugar water and artificial flavoring gems we all had as kids. Yum! You-Call-This-Lime? : Well, I definitely wouldn’t call this lime. In fact, I’d have trouble coming up with any flavor at all. Maybe Generic-Artificial-Flavoring flavor? Pink Sand: At first blush, I would have said Pepto-Bismol flavor, but as the flavor progressed I would have to change that to crappy cough drop cherry flavor. My tongue actually burned a little. Definitely my least favorite. Fossilized Antacid: This is mint. Most definitely mint. Actually, once you start chewing, it’s kind of a strong mint flavor. It reminds me a little of the chewable Pepto-Bismol tablets. Not unpleasant, though the mint can be a bit overpowering towards the end. As with all conversation hearts, the texture is hard and chalky, but not necessarily unpleasant. The nice thing about these specific examples is that because they are larger and slightly thinner than the regular versions, they’re easier to break up as you chew. These also have a slightly stronger flavor than some of the others, though that could be due simply to the fact that there’s more substance in each piece. Other collections include “Dejected” and “Dysfunctional” which both have different sayings. Overall, I have to say that I’m pleased with these, both in terms of flavor, and because they fit right in with my feelings of Valentine’s Day. If you’re as jaded as me, you won’t go wrong with these! Bittersweets are available at the Despair website and will soon be available at ThinkGeek.com also. LOL! !! “CELIB8 THX2U” I first read that as Celebrate… HAHAHHA! I need these for work!